This is “Fixed Exchange Rates”, chapter 11 from the book Policy and Theory of International Finance (v. 1.0). For details on it (including licensing), click here. Fixed exchange rates around the world were once the only game in town; however, since the collapse of the Bretton Woods system in 1973, floating exchange rates predominate for the world’s most-traded currencies. Nonetheless, many countries continue to use some variant of fixed exchange rates even today. This chapter addresses both the historical fixed exchange rate systems like the gold standard as well as the more modern variants like crawling pegs and currency boards. Learn the five different reasons why trade between countries may occur. Till now we have said that a central bank must intervene in the foreign exchange (Forex) market whenever there is excess demand or supply of foreign currency. However, we might consider what would happen if the central bank did not intervene. Surely the government could simply mandate that all Forex transactions take place at the official fixed rate and implement severe penalties if anyone is caught trading at a different rate. A black market arises, however, when exchanges for foreign currency take place at an unofficial (or illegal) exchange rate. Let’s consider why a black market may arise. Suppose the United States fixes its exchange rate to the British pound at the rate Ē$/£. 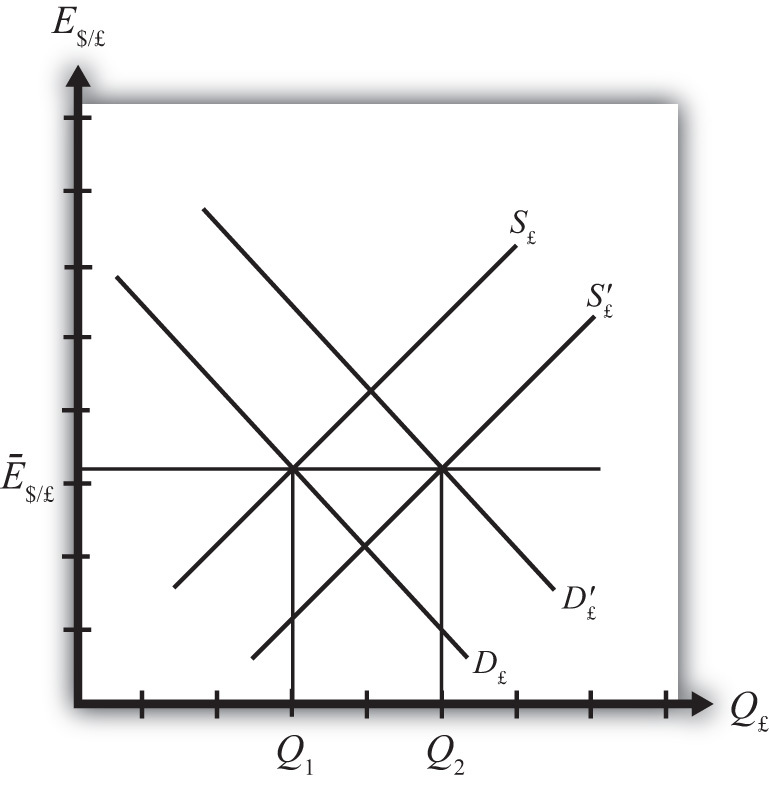 This is indicated in Figure 11.3 "Conditions for a Black Market" as a horizontal line drawn at Ē$/£. Suppose further that demand for pounds (Q1) on the private Forex exceeds supply (Q2) at the official fixed exchange rate, but the central bank does not intervene to correct the imbalance. In this case, suppliers of pounds will come to the market with Q2 quantity of pounds, but many people who would like to buy pounds will not find a willing supplier. Those individuals and businesses demanding the excess (Q1 − Q2) will leave the market empty-handed. Now if this were a one-time occurrence, the unsatisfied demand might be fulfilled in later days when excess supply of pounds comes to the market. However, a more likely scenario is that this unsatisfied demand persists for a long period. With each passing day of unsatisfied demand, total unsatisfied demand grows insidiously. Together with the excess demand is a willingness to pay more than the official rate to obtain currency. 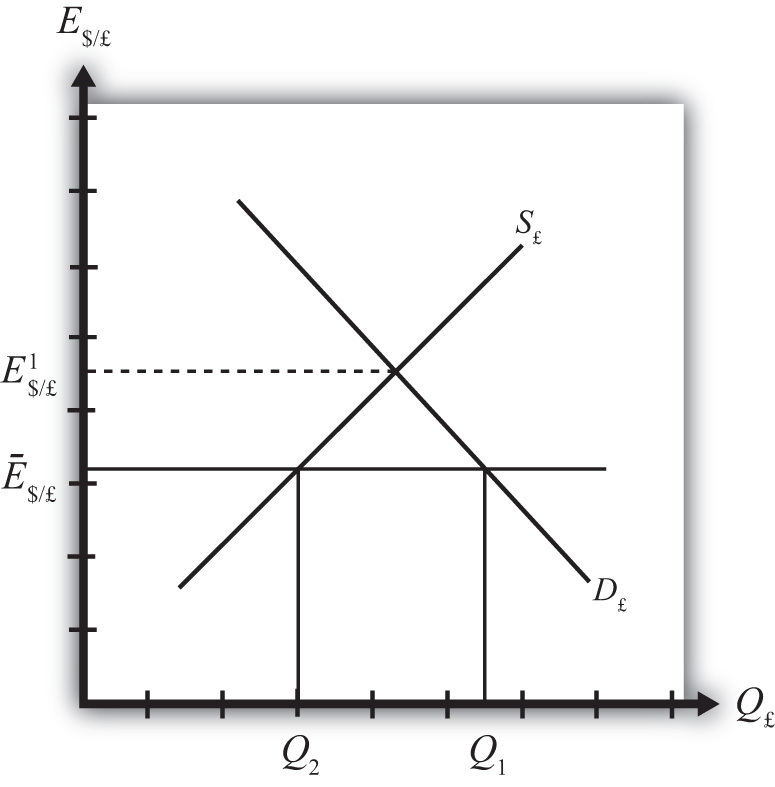 Since the market equilibrium rate is at E$/£1, excess demanders would be willing to pay more dollars to obtain a pound than is required in the official market. The willingness to pay more creates a profit-making possibility. Suppose an individual or business obtains pounds, perhaps by selling goods in Britain and being paid in foreign currency. This person could convert the pounds for dollars at the official rate or, if he or she wants to make more money, could trade the currency “unofficially” at a higher exchange rate. The only problem is finding someone willing to buy the pounds at the unofficial rate. This turns out rarely to be a problem. Wherever black markets develop, unofficial traders find each other on street corners, at hotels, and even within banks. Thus a central bank doesn’t absolutely need to intervene in the Forex market in a fixed exchange rate system. However, if it does not, a black market will very likely arise and the central bank will lose control of the exchange rate. One main purpose of fixed exchange rates, namely the certainty of knowing what the currency will exchange for, is also lost since traders will have to decide whether to trade officially or unofficially. Furthermore, the black market exchange rate typically rises and falls with changes in supply and demand, thus one is never sure what that rate will be. In light of the potential for black markets to arise, if a government wishes to maintain a credible fixed exchange rate, regular intervention to eliminate excess demand or supply of foreign currency is indeed required. A black market arises when exchanges for foreign currency take place at an unofficial (or illegal) exchange rate. If a central bank does not intervene regularly in the Forex market, a black market will very likely arise and the central bank will lose control of the exchange rate. The term used to describe currency transactions that occur at unofficial exchange rates in a fixed exchange rate system. Of buy, sell, or do nothing, a central bank will likely do this with its reserve currency if excess demand for its own currency leads to illegal trades at a higher value. Of credible or not credible, this describes a fixed exchange rate system that coexists with a black market.